When navigating this page use your "Back" button to return to this index. Our power trucks are for 12 volt Direct Current operation only. The use of Pulse Power or any half-wave circuitry that exceeds 12 volts will void any warrantee claim you may have. Modern DCC is fine. When operating any power unit please keep in mind it must be kept clean and oiled. If it is not run on a regular basis a periodic cleaning and re-oiling will keep it operating indefinitely. Pick out any fuzz, hair, or other mineral fibers that may have wound themselves around the axle stubs where they enter the bearings, or near the gear box. The easiest points to oil are the axle stubs where they enter the sideframe, and the rear motor bearing. One small drop of oil at these points every month or so will keep things operating smoothly. The other areas to oil are where the axles enter the gear box, and indirectly the gear and worm. 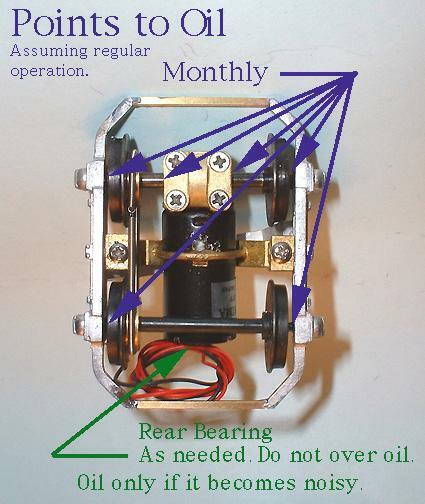 A small drop of oil where the axles enter the gear box should be done monthly. To get oil to the gear and worm place a large drop of oil on the axle where it enters the gear box and allow the oil to run into the gear box by gravity (hold the truck on its side while running it.) If you run the truck forward and backward while the truck is on it's side the oil will be drawn into the gear box and be distributed to the worm and gear. If your car has sat for any period of time greater than 6 months we recommend you follow the above oiling recommendations. Dry bearings are the single greatest cause of truck failure. You may want to brush wash the sideframes bearings with mineral spirits. When dry you can then oil these bearings with one drop of fresh oil. We do not recommend taking gear boxes apart to service them. The gear to worm backlash is set during manufacture and the bearing half tension is also set. Undoing the gear box half, or removing the motor from the box disturbs these settings. Do not immerse the entire truck in any cleaning solution to try and clean your truck. This will clean your bearings, BUT it will put a film on the motor commutator which you WILL NOT be able to remove. This film will cause arcing and that will prematurely shorten the life of the motor, or kill it altogether. Do not brush wash the rear motor bearing with mineral spirits. This will migrate to the commutator, and cause a film that will hamper motor operation, and eventually cause motor failure. If a truck develops a derailing problem on trackage known to be good, check it for uneven wheel contact, or out of tram condition. Twisting the truck as shown on the right will correct for uneven rail contact. This is a diagonal twisting motion; high-corner down at each end down towards the rail. If you go too far just reverse the twist until all four wheels are resting on the rails. To correct for out of tram condition carefully push at the ends of the truck that appear away from the other. This must be done with care or you will destroy the truck. Also keep in mind that the nature of white metal castings will sometimes create this condition as not all castings will be of equal length. A slight out of tram condition is usually not a problem so only correct for this if there is a serious derailing problem. Our trucks are designed to operate on Atlas track; this track has very minimum standards as far as railroading is concerned. If your trackage is at least to these standards you will have no problem utilizing our trucks. Operate often for best results. Assuming that the layout track and overhead wire is kept clean and free of dust and dirt, and all electrics are sound, should your car start to operate erratically there are some things that should be kept in mind. Over time the pivot points of most truck and car bolsters will become dirty. To maintain a good ground on overhead cars, and electrical continuity on two rail cars, these surfaces should be cleaned periodically. Make sure your electrical connections are clean and tight. Cold soldered joints will cause poor electrical conductivity. As trucks run the sideframe bearing points will accumulate dirt. The oil at these points are a magnet for dust and dirt. If these bearings become gummy, they should be cleaned with mineral spirits, followed with a re-oiling. Do not use any cleaning solutions on the rear motor bearing. If it becomes dry, just add one small drop of oil. On cars with pole reverse, where the pole makes contact with the pole hook, the blackening agent on the pole must be removed. The bottom of the pole hook, must be clean and free of paint or dust. Make sure on B2 Trucks with clasp brake shoes that the shoes have at least .020 clearance between the shoe and the wheel. Shoes can be bent back during derailments, and come in contact with the wheel. This "brake on" condition could lead to premature motor failure. Wheel surfaces will become encrusted with dirt. Check these for any type of buildup, and clean as necessary. Finally, regular maintenance is essential in keeping your cars operating properly. A little time spent every now and then is all that it takes to keep your trucks in good working order. We use a piece of carpet padding to support models while we work on their undersides. Win Nowell suggests the foam rubber inserts found in some brands of ice cream cones. These have troughs that will hold a model in position while truck maintenance is performed on them. Labelle Industries makes a nice variety of lubricants, and they come in oilers with very fine long tube spouts that allow you to reach in very tight places. These can be purchased at your favorite hobby store (we do not stock or sell Labelle oil).